Please browse these pages of unusual items from County Kerry Ireland. 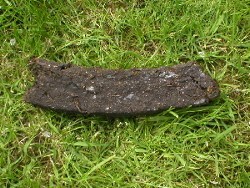 A sod of genuine Irish Turf from the leafy bogs of County Kerry Ireland. Experience the captivating aromas of a warm burning sod of Irish Turf Peat. Close your eyes, relax, think back and literally go back in time to those cosy, calm, heady evenings of your youth. Sitting around the blazing open fire with your family, some of who have travelled from the corners of the earth for a summer holiday, visiting friends from up the hill and across the fields. Chatting about politics, the craic in the bars and the latest bit of gossip. Take one deep breath of the scent of the smouldering turf – and you are there, you have gone back in time you are once again around the old open fire, with all your memories still intact. Now you can enjoy this experience in whatever part of the world you have made your home, but never forgetting from where you came from. We will ship direct to your home a genuine Sod of Irish Fire Turf. Each sod measures approx 1 foot (350mm) long and approx 3" by 4" (75mm by120mm) square. Each SOD of Genuine Irish Turf is just 15 Euro plus Shipping. You do not need to be a member of paypal to be able to purchase by this method just click on the logo at the base of this page and follow the step-by-step instructions. Send Euro Cheque to: Thomas O’Connor Sandford House, Cliff Walk, Ballybunion, County Kerry, Eire. Send Euro Cash in Registered Mail to above address. And I will get back to you with total.